Socrates Was a Hipster. We Think. We’re Pretty Sure. Sort of. Thanks to fellow-blogger Bill Caraher and his Punk Archaeology blogspot (in collaboration with Kostis the Greek), a couple weeks ago I came within the gravitational pull of the 2010 publication, What Was the Hipster? : A Sociological Investigation (New York: n+1 Foundation Publishing). While sitting in a coffee shop on the NDSU campus in Fargo this morning, I pushed through the conversational elaboration about what was the hipster, what is hipsterism, and what the future might be for the kingdom of hipsterdom. This all came from a 2010 round table discussion between folks who have thought good and hard about hipsterism today and yesterday. …There were some uncomfortable moments: the one guy sporting a trucker hat stared straight ahead as Mr. Grief talked about how guys in trucker hats were striving for some sort of faux-authenticity. And when Mr. Grief hit upon the prevalence of pornographic and pedophilic mustaches among hipsters, one heavily mustachioed man seemed to listen more intently, while his thinly ‘stached friend mustered an awkward laugh. Reading “What Was The Hipster? 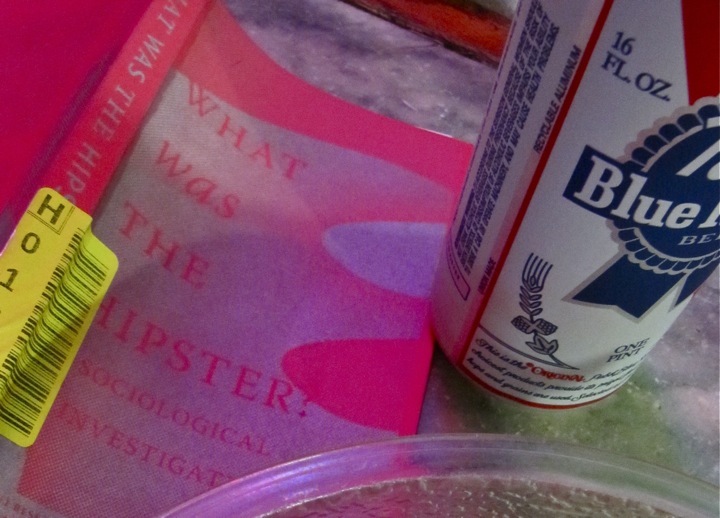 : A Sociological Investigation” (2010) while sipping a hipster Pabst Blue Ribbon beer at a fairly hipster tavern in Fargo, North Dakota. Western Civilization course, the topic today taking freshmen and sophomores into the 7-5th BCE Levantine world of Assyrian, Chaldean and Israeli empires and/or kingdoms. During the lecture and while scribbling down notes, I wondered whether or not Socrates was the original hipster, at least before it became un-hip to be called a hipster (it’s now hipster to claim that you are not a hipster). One of the main complaints that hipster haters have toward hipsters, at least in the book, is that the original hipster shirked style because they were devoting their energy to reading and thinking and conversation. Eventually, though, hipsterism was appropriated, commercialized, and mainstreamed, which is why factories in southeast Asia crank out skinny jeans and middle-men inflate the prices and sell them to young, white Americans born into wealth (it was not their fault). Another complaint, though, was that hipster haters said more about themselves in hating on hipsters than they did about the actual hipster. It’s unhealthy to hate. Find something more productive to do with that time — perhaps by finding out how to market hipsterdom to up-and-coming hipsters. Why I continued wondering about how Socrates may have been a hipster came by way of how he was always on the cusp of asking the next question. He wasn’t all too interested in the most suave tunic (why would he be, since time is better spent philosophizing). There most certainly were those that made the aesthetic equation that if Socrates looked drab and was a high-powered intellect, then one could simply purchase drab and thus be some kind of high-powered intellect (where people would follow you around and write down what you said). A fallacy to be sure. If this is so, then does that mean Hellenism was a variation of mass-produced hipsterism? After all, to be hellenic meant to be, or want to be, Greek. And once again we return to the fallacy of authenticity, or even purity, two dangerous words that are tossed about quite a bit. Is there such a thing as an authentic hipster? Who knows. The conversations are important, but try to embrace the irony and absurdity of it all, a far more constructive outlet than the hipster haters seem to be carrying on with. This entry was posted on Friday, September 7th, 2012 at 4:18 pm	and posted in Uncategorized. You can follow any responses to this entry through the RSS 2.0 feed.